Whoooooo-weeeeeeee! These aren’t your mama’s green beans (unless your mama’s made these before). Near Leakey, Texas is a sweet family owned joint called Neal’s Lodges. It’s been around since the 1920s and has an awesome restaurant that overlooks the Frio River. Every weekend, they serve creole green beans as one of their sides, and I finally decided to decode the recipe after I was given blank stares when I asked for it. Apparently it’s an old family recipe….. 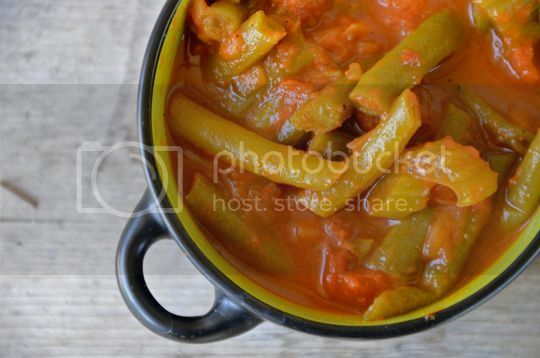 These green beans are savory and spicy! Just the kick you need for your barbecue or picnic. For less heat, decrease creole seasoning and black pepper. This recipe will be very saucy, so if you want more bulk, I recommend using another pound of green beans, or for less sauce, use less chicken broth. Wash and trim ends from green beans. Put olive oil in a large stockpot, and heat over medium-high heat. Add onions and saute for 2 minutes or until softened. Add celery and saute for another minute. Add green beans and stir together. Add the rest of the ingredients; 2 cans of diced tomatoes with juice, 3 cups of low-sodium chicken broth (or less if you want less liquid), 1 can of tomato sauce, 1 teaspoon black pepper, 2 teaspoons of creole seasoning (this can be reduced to taste), 2 dashes of cayenne pepper, and 1 teaspoon brown sugar. Simmer for at least 45 minutes or until green beans are tender.